Lovely cake, bet it was yummy! Happy birthday to Tyler! Fantastic cake! What a gorgeous cake! Sure it was yummy too! Happy Birthday Tyler! Save us some cake! Mmmm, yum! 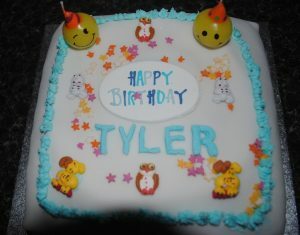 Happy Birthday Tyler! Beautiful cake! Happy birthday to Tyler! Love the whole theme of silent Sunday! ooooh! Looks like a tasty cake, hopw it was a good birthday!